The couple committed suicide by jumping out of a window of a New York City office building together in desperation over their inability to afford their health care. The incident happened early Friday morning on the corner of Madison Avenue and 33rd Street – just a block from the Empire State Building. The bodies of 53-year-old chiropractor Glenn Scarpelli and his wife, 50-year-old, Patricia Colant, were found in the middle of the street on 33rd Street between Park and Madison avenues in Murray Hill at about 5:45 a.m., police said. Glen and Patricia, both left notes titled ‘We had a wonderful life’. This was confirmed by a law enforcement source who said that Patricia’s note states: ‘Our kids are upstairs, please take care of them’. A 53-year-old chiropractor and his wife jumped together to their deaths from a building in Midtown early Friday after leaving a note complaining of financial woes, police said. The couple lived in downtown Manhattan, left behind suicide notes. The notes were found in separate Ziploc bags that contained the victim’s IDs, sources said. 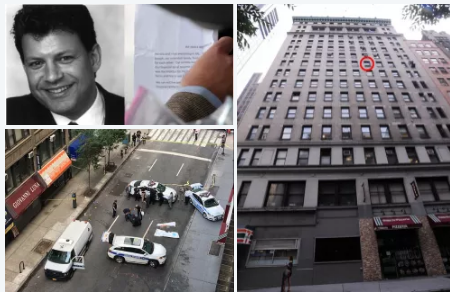 The middle-aged couple leapt from his ninth floor office, which had recently been permanently closed in the 17-story commercial building on the corner of Madison Ave. and E. 33 St. about 5:45 a.m., sources said. Their bodies lay covered under white sheets near the sidewalk on E. 33 St. as cops shut down much of the block to investigate the unusual double suicide.